You can use your iPhone to give yourself workout goals and track your progress. 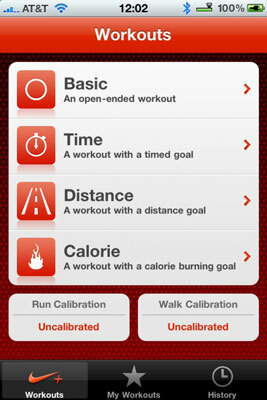 The Nike+ app for the iPhone can help you meet your fitness goals. Apple has teamed with the folks at Nike on a wireless sports kit that lets runners place a sensor inside a Nike sneaker that can wirelessly communicate with an iPhone 3GS or 4 (but not earlier iPhone models). As runners dash off, they can track time, distance, and calories burned, receive vocal feedback, and upload results to a Nike Web site. Runners can even play a select “power song” for that last push when they’re feeling exhausted. 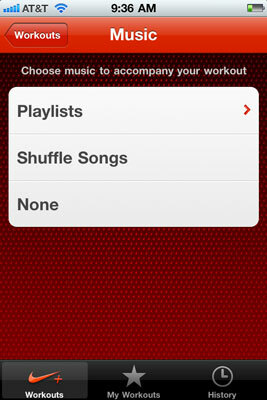 Basic: This option basically just lets you choose a playlist to listen to while you run. Time: Lets you choose the length of your workout. 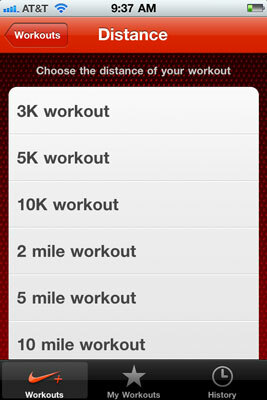 Distance: If you’re running or jogging, Nike+ lets you know when you’ve reached your distance goal. Calorie: Counting calories? 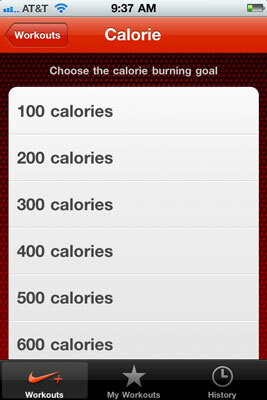 This option lets you know when you’ve burned off an approximate number of calories.